Nissan has been working on, slanging, a Nissan GT-R around Nurburgring since the R32 GT-R. From the mid 8 minute mark for the R32, to the 7:59 mark for the R33 GT-R, the times keep dropping further and further towards the 6 minute mark. In this video, the latest car, the 2012 MY global car, or the 2013 US car gets hustled around the green hell. 7 minutes and 21 seconds later, the trip is over, and its time to insert another 100 yen, or quarter. 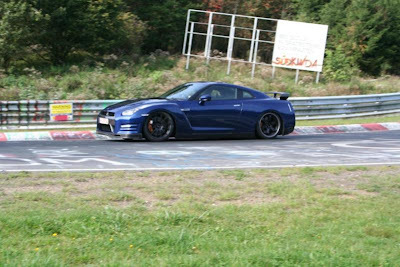 Even though this is the time that Nissan has shown for the GT-R, don't think that the 7:21 was the quickest time they have done. They need to test it again. I'm sure it is capable of 7:18. The ZR1 does 7:19, I'm sure this one can do at least 7:18. Some of those corners can be taken at faster speeds than what these guys did. Definitely not the fastest time the car can run. It is fake. Know why? The car was put for tire performance experiments, no intention for lap times. At least spokeperson Nobukazu Tanaka announced that. He also announced that the video may have illegitimately spliced some clips of real footage and "broadcasted through consumer generated media (CGM)"